Oh it felt so good to get into the DIY spirit once again. I stayed home all day, mowed the lawn, cleaned the house, then took a wander outside to inspect the hydrangeas. We are now in fall mode, still with warm skies, but with that special nip in the air, that signals hydrangea harvest time before the rain returns. I have no idea what this berry tree is, but I call it the Bird Bar. I’m just waiting for the birds to get drunk and fly into our picture window again. Guess I’d better get something hung up fast! And right under the bar… there you are, you purple beast you… but notice anything peculiar? You aren’t seeing things. ONE blue flower! The entire bush use to be blue, so I guess someone else is attempting to hold onto summer just a little while longer as well. You know when it’s time to harvest hydrangeas, yes? 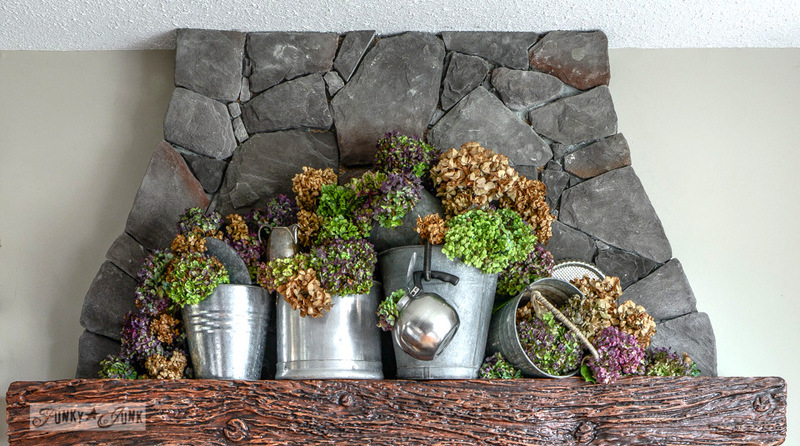 When the petals turn a little bit crispy, that’s the time to bring them indoors. HERE is a post on how I harvest and dry them, wilt free. Each year, the soil helps deliver a different colour palette. I’m kinda diggin’ the lime and purple variation! And this is where they will go. 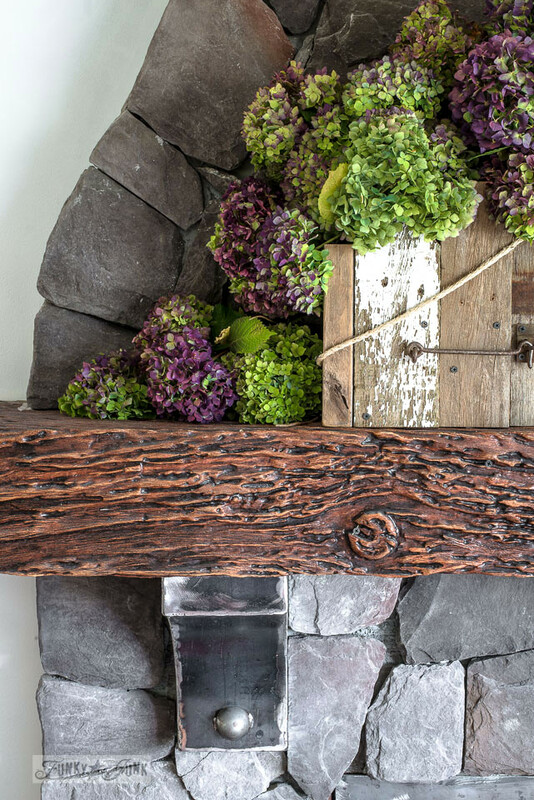 Remember this little reclaimed wood window box tutorial? Let’s fill this guy up! And boy, did this box hold a LOT! 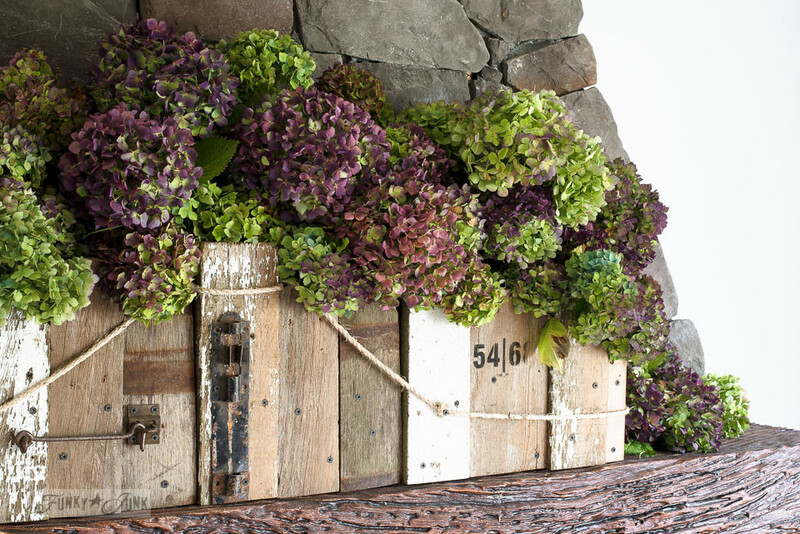 I first placed large containers of water inside the box, then set as many hydrangeas in them as possible. But not all stems reached the water. Many more were layered on top, alternating lime against purple, and being careful to ‘stack’ them, vs. having them all smooth. 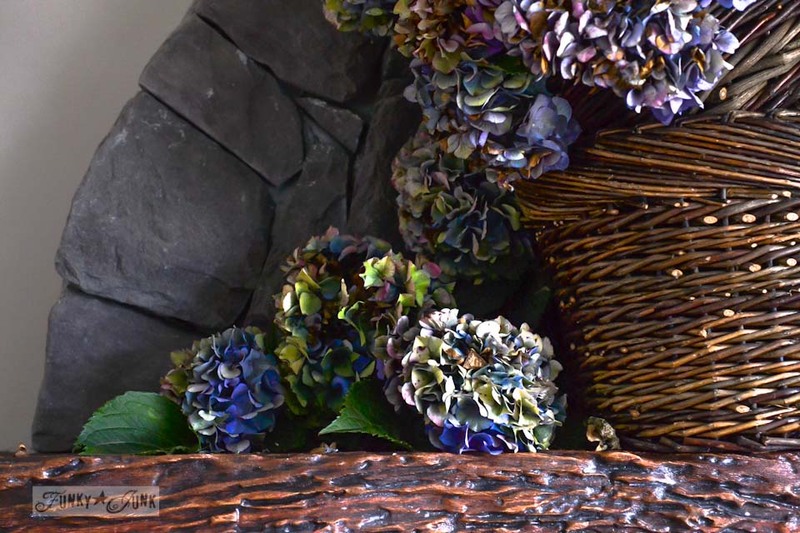 Here’s a post explaining how I arrange hydrangeas. Owning NOTHING in a lime or purple colour, I had to get a little crafty. 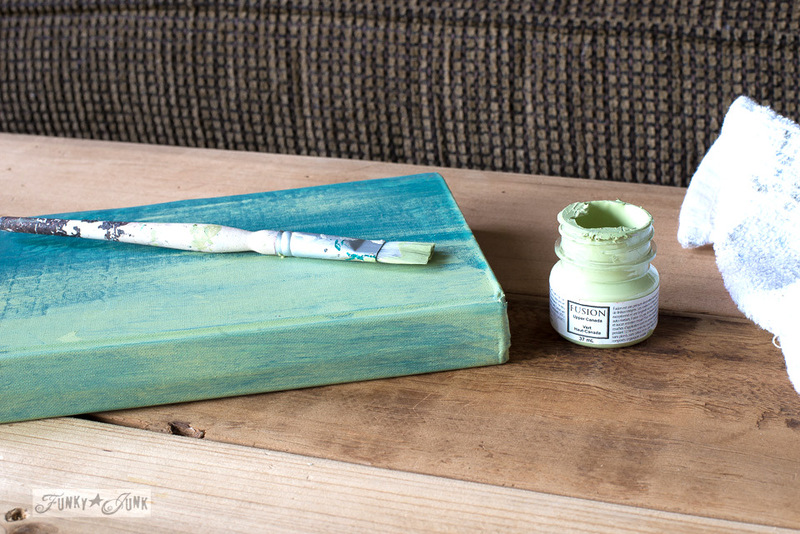 Fusion Mineral Paint’s Upper Canada Green is a super fresh shade that was perfect for painting a book or two. Then I lit the first fire of the year, and called this done! I second it! Whoohoo! Yeah Fall!! It has always been my favorite season. 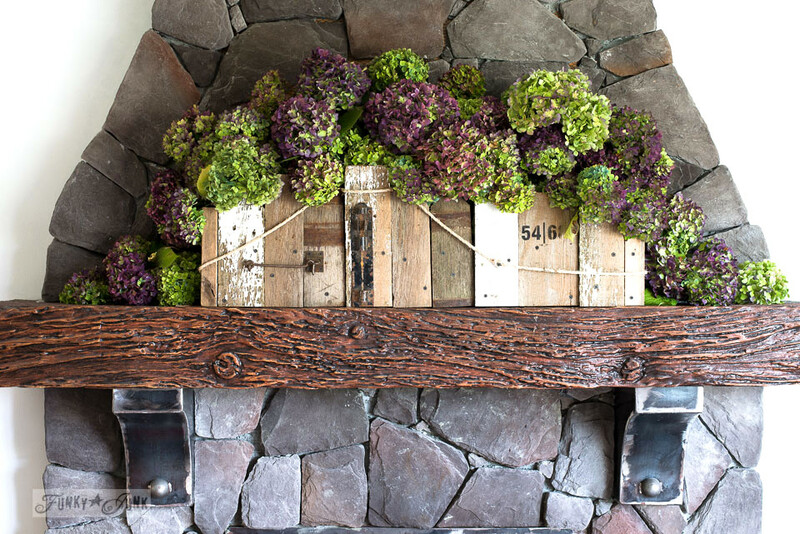 And hydrangeas have always been one of my favorites. I can’t get enough of them. 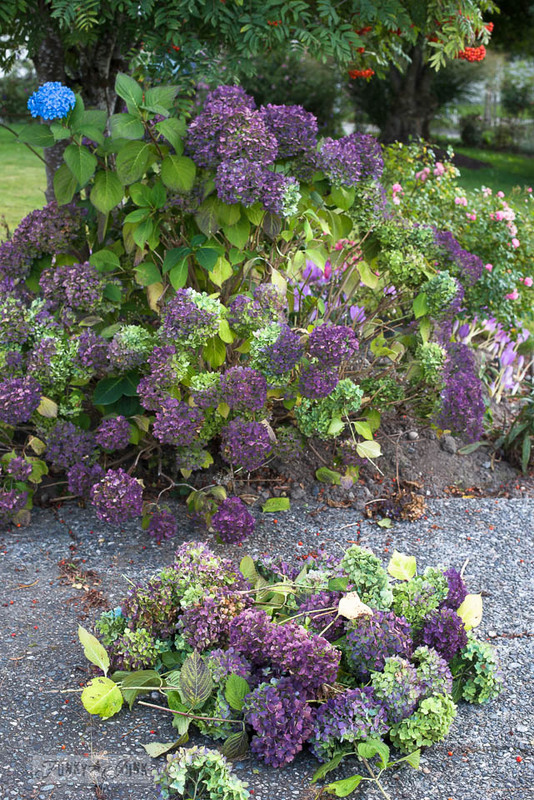 I have a neighbor down the street from us who has beautiful hydrangeas at the beginning of her driveway and I’m athinking of asking her if I could clip some. Also liked the color you painted the book with. Can we see how you arrange them? Thanks and hurray for the POST!!! 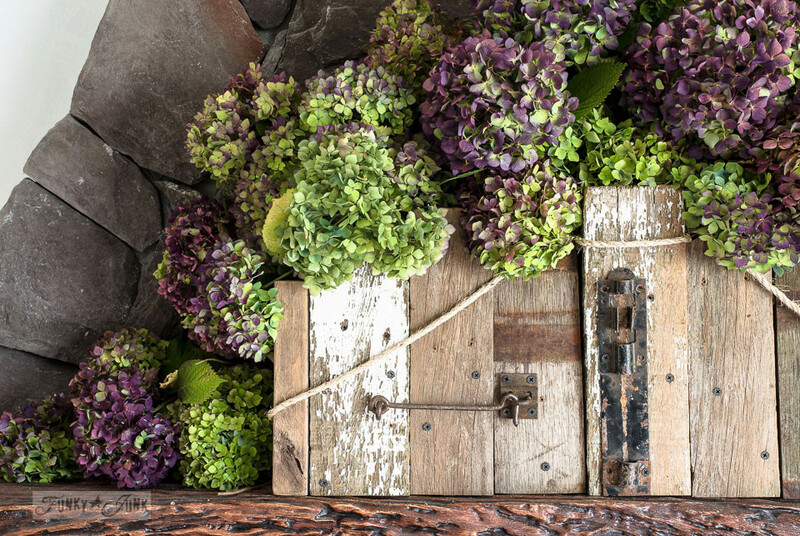 My heart be still….those hydrangeas are absolutely beautiful! And what a beautiful tree! 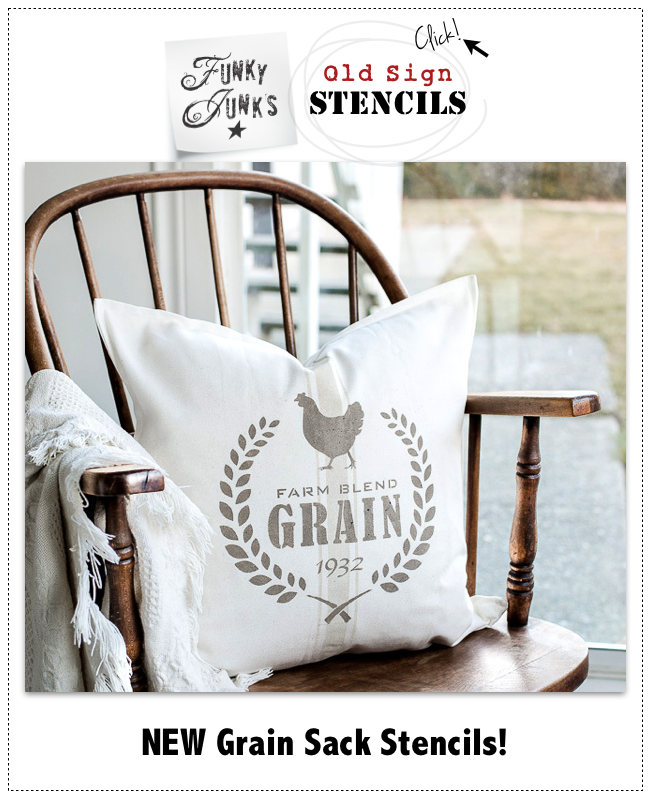 I can only imagine how peaceful it must be to sit with a cup of coffee on your porch and take it all in…. Sigh….Thank you Lord for such beauty!! Awesome and I love that little splash of green. Looks like your place is tucked in a beautiful area. 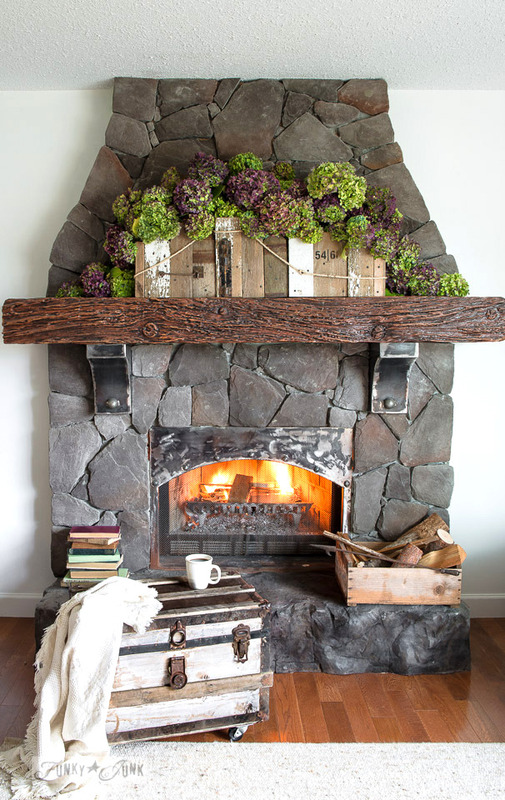 This fire place is also a favorite – it’s always fun to see what you’re going to do next. LOVE this!! 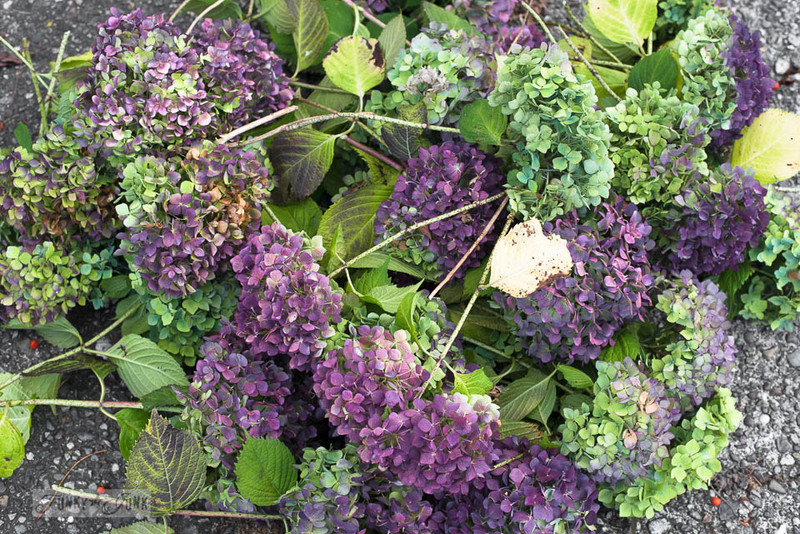 Wow… those purple hydrangeas are absolutely beautiful and next to the green is so stunning! It’s beautiful!!! This is my favorite one so far!!! Your Bird Bar is called a Mountain Ash Tree. My Mama has always had at least one in her yard to attract the birds. I kinda like your name for it…ha! Wonderful to see this post today. 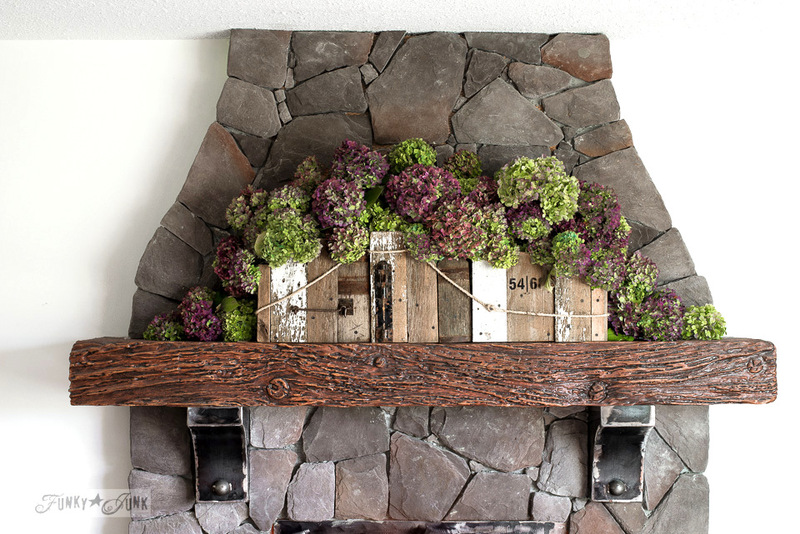 Your hydrangeas are gorgeous and love your fall mantle. I love fall just don’t like what follows, As soon as Christmas is over I’m ready for spring, but for now I’m enjoying cooler nights less humidity and now the trees are starting to change and I’m loving it after the hot, hot summer we have had. So jealous! With the warm weather here in Connecticut last January and then a drought this summer I did not get one single flower on any of my hydrangea plants. No apples this year too. I will have to just admire yours from afar! Hi Donna. 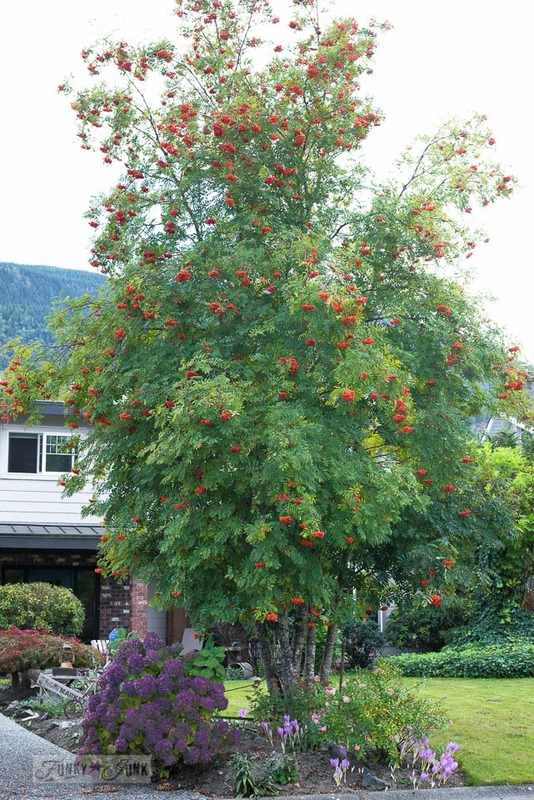 I believe this beautiful tree is a Mountain Ash. Despite its name, it’s not an Ash at all. It’s in the same family as the Hawthorn and the Apples. And, yes, they are quite beautiful! It’s good to have you back. Hope things are doing better. 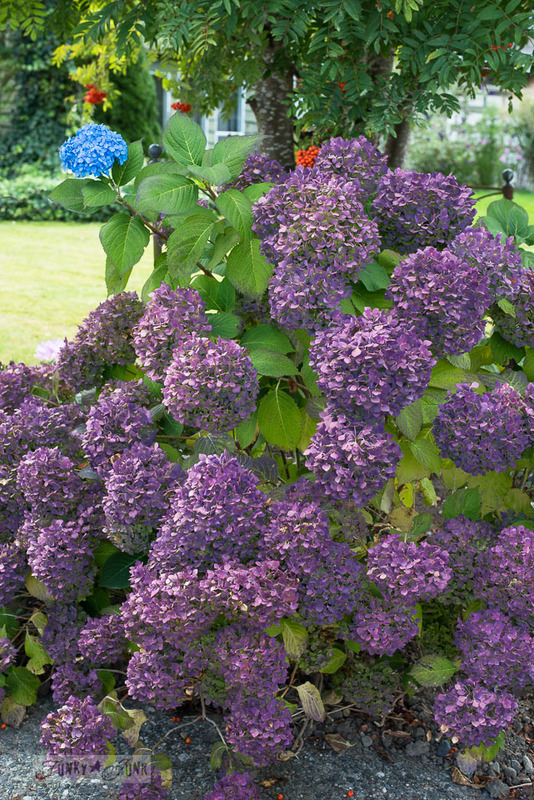 About this post, it’s really nice, I love hydrangeas, they are my most favoritest flower. (I know that’s not correct English), but that’s the truth. We have several plants. Unfortunately we’re moving off the farm and have to leave them all behind. But, we will be taking some with us, if we can dig some of them up. I know they can be rooted from cuttings but I’ve never done. Must try that. Anyway enough of my ranting. ave a fabulous day Donna. For the second year in a row I did not get ONE bloom on my hydrangeas and I still don’t know why. Yours are absolutely beautiful. I am so glad you are back, I’ve missed you and I’ve missed the kitties. 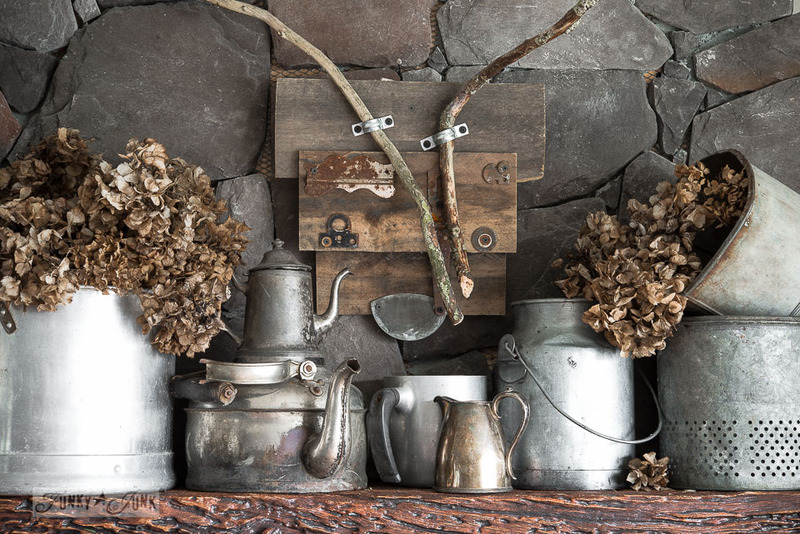 Hello Patty: try and find out what kind of hydrangeas you have as SOME put out next year’s (2017) blooms on OLD wood (meaning the current year’s “wood”) and some don’t care when you prune or cut back the bushes. Also, sometimes – if you’re just plain unlucky like I’ve been – you’ll have a hydrangea that puts out mammoth, healthy looking leaves with no blooms whether you prune OR don’t prune!! Good luck!! God love you! You are back! 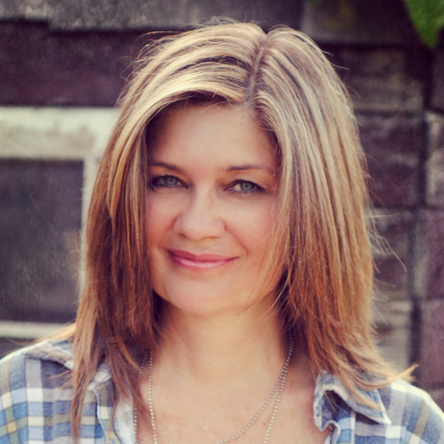 And the “voice” of your blog sounds good — strong & full of life. PS loved your purple hydrangeas, too???? Donna, it’s so good to see you back doing what you love. I believe the tree with the orange berries is Mountain Ash. 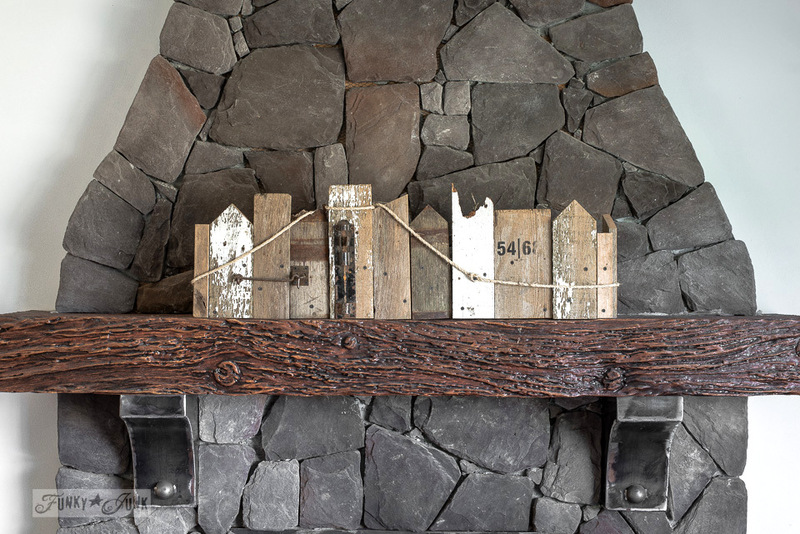 Great mantel design. Your hydrangeas are marvelous. Good to have you back. What beautiful hydrangea’s you have. I am jealous, I have huge bushes but very few flowers and they are always pink. How do you get the purple and green? Living on the coast of California and not having been here that long I am learning to garden all over again. Last year I cut the bushes way back after blooming within a couple of feet of the ground, if that. Maybe I cut them to far back? Thank you for your hints in drying the flowers. Those hydrangeas look lovely! I have a few planted on my backyard, I think I’ll also make a fall decoration with them. Thank you for the inspiration! SO GLAD you’re back, Donna!!! :). What a gorgeous post you gave us – lime and purple!! I’ve never seen purple ones before. Do you remember I told you that I bought a condo after I lost my husband? Well, guess what’s outside the front of my building? 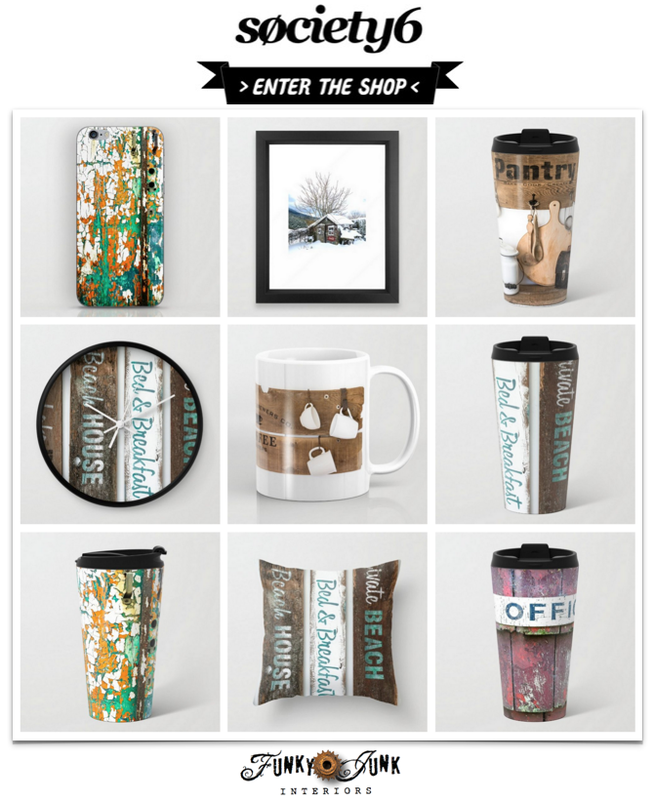 Yes, you guessed it …. a huge hydrangea bush and it’s loaded with white (turning green) blossoms! I sort of think this place was meant to be. We had an incredibly hot, hot Summer and so far, September too – so they aren’t papery-dry yet but I’ll be out there some October night sneaking in about four branches!! My first Fall, I was concerned I may have harmed the shrub but I’ve witnessed two Springs now (watching it for any damage) but it just seems to get bushier and bushier!! Yeah! I’ve missed your blog, you are my favorite. I believe that tree is a Mountain Ash, also called a Roan.